One can have a glimpse of a typical class @ RIMYI. In this short video clip, it shows Geetaji teaching Trikonasana. -Iyengar Tradition experienced Iyengar Yoga for the 1st time in 2002.
not learning-to-do, not learning-to-teach, not learning-to-etc. Good News from a Student - Cyst situation. This morning while collecting my passport, I received a piece of good news from a student (of 2+ years). I won't be sharing the name as she has requested. However she is willing to share this good news as it came as a surprise to her. Though she didn't practice yoga specifically to treat this. However, with appropriate practices during class times and also making a trip to India to pay a visit to my mentor - Abhay - helps. 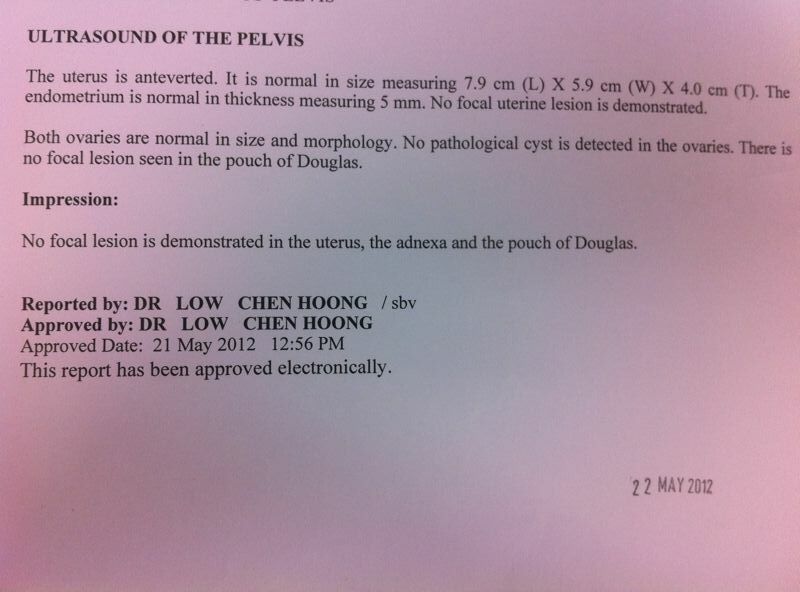 A Scan done in 2010 has shown that she has a cyst. 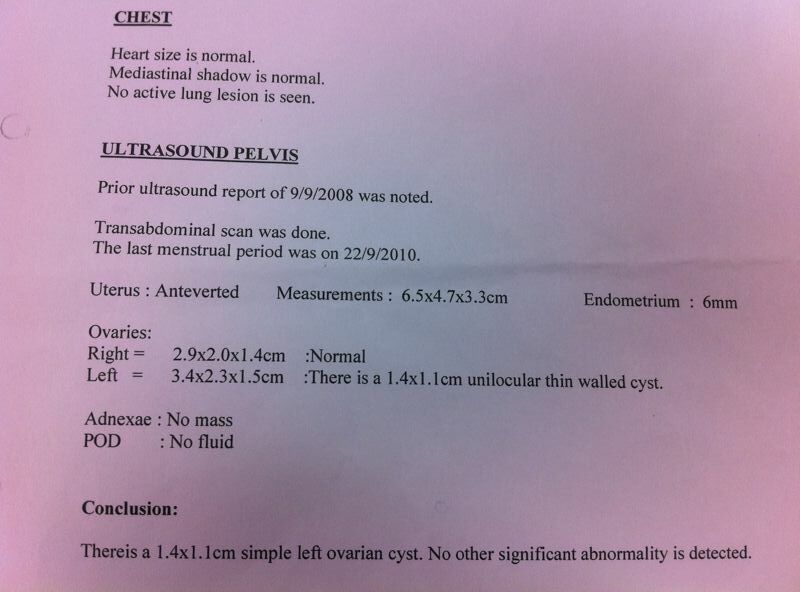 A Scan done in 2012 has shown the cyst she has previously is gone. we are not as lucky as F1 cars.. they can replace engines, tyres, fuels... as long as they have $$... but human systems... when the limits are constantly challenged way beyond recovery-rate/repair-rate... i suspect sooner or later there will be parts that is unable to repair fast enough... and it will show up in pain & aches... that refuses to go away..
[Lynn is a good friend of mine, we met in Pune in Jan 2009, and have kept in touch discussing about yoga, especially yoga in the teachings of Guruji, Geetaji & Prashantji. She gave a talk recently during the RIMYI Annual Day - a day where students of Iyengar Yoga come to together to celebrate the birth of the institute some 37 years ago. Each of us has our own journey that we have to travel and today I am going to speak to you about my journey and specifically about how my experience in the medical class at RIMYI changed my life. I have been practicing yoga since 1974 and iyengar yoga since 1989. My story today begins in 1993 when I had the first of three major operations on my right ear to remove a tumour growing very close to my brain. The result of this surgery was that I became permanently deaf in my right ear, the entire mechanics of my ear were removed and the sternocleidomastoid tendon cut. When I was discharged from the hospital and well enough to go back to my life, I discovered that I had completely lost my sense of balance, and I could also no longer distinguish where sound were travelling from. The biggest effect of this operation though was to my yoga practice. This experience was very humbling as I had to go right back to basics and relearn all my standing poses as if I was a new student. I didn’t know back then that starting a fresh every practice is what we all need to do to deepen our yoga. I tried really hard not to be angry with my body. I would fall over constantly until I learnt how to change the weight distribution in my feet to allow and compensate for my loss of hearing. My right shoulder also became very unstable due to my surgery resulting in four major shoulder dislocations. My yoga practice had to change. I had also lost all confidence in my ability to protect and support myself in my practice. Once again I tried very hard not be angry. I would cry a lot. Not only had my yoga practice changed but my life, as without my hearing in my right ear my world became almost insular. As in social situations I could not hear the conversations around me. I guessed what people were talking to me about. I became very busy in my head too, due to my world becoming so internal and intense. I knew I needed to come here in Pune to the institute to learn how to support my yoga practice and my life. In 2009 I came for the first time to Pune and was privileged to be accepted into the Medical class. I was very nervous as just three months before attending the institute my shoulder had dislocated again. I knew in my heart though that I needed to learn. Geeta S designed a practice for me and after two days of taking part in the medical class Guruji came with Stephanie and worked with me for the entire class. With Guruji working with my body and mind I felt as if a miracle had been performed. I could feel my body on such a deep level I have no words to explain. Also my mind became very quiet as if my consciousness had been transported to a completely new place. I knew then what this feeling was and what yoga is and that I must work to reach that same place in my own yoga. My heart truly felt as if it would burst with gratefulness. Once again for the second time in my life I was truly humbled. I am very grateful for all the help I received in the medical class that month, and I returned home feeling more confident with my body and my yoga. Then two weeks on returning to Australia I was involved in a terrible accident resulting in a broken right leg and left wrist. I couldn’t practice asana at all for over four months. All the learning I had gained in the medical class I could not practice at this time. I was so sad. In my mind though I came back to the quiet feeling I had experienced in the medical class and I focused my practice on pranayama. Every morning I would spend an hour practicing pranayama sitting on a chair as I couldn’t get myself up from the floor. I did savasana in my bed. But I really struggled as my mind and body were aching to do asana practice. For the first fifty minutes in my pranayama practice everyday I really struggled. I kept thinking about all the parts of my life I couldn’t participate in. But the last ten minutes of this practice were magical. I would go into another space in my mind which was very quiet and still, and it felt as if my very soul was being nurtured. I felt absolutely honoured to be given this opportunity and time in my life to be able to feel what I was feeling on such a deep level. Then just yesterday I was blessed once again with the kind help of Geeta S in the women’s class, as my practice is slowly evolving small steps at a time. In conclusion, I am giving this talk today as my way of publicly thanking Guruji Geeta, Prashant, Abhijata and all of you at the institute for giving me your time and allowing me to learn and to heal. 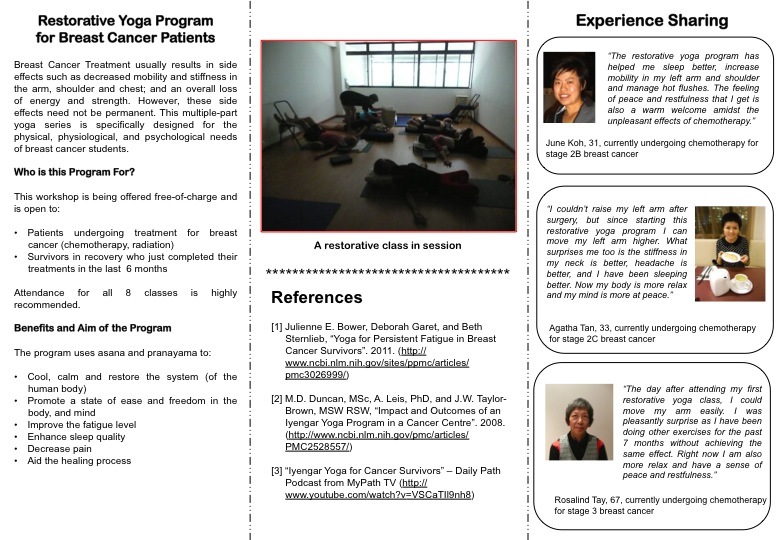 A medical class with Dr. Geeta S. Iyengar. 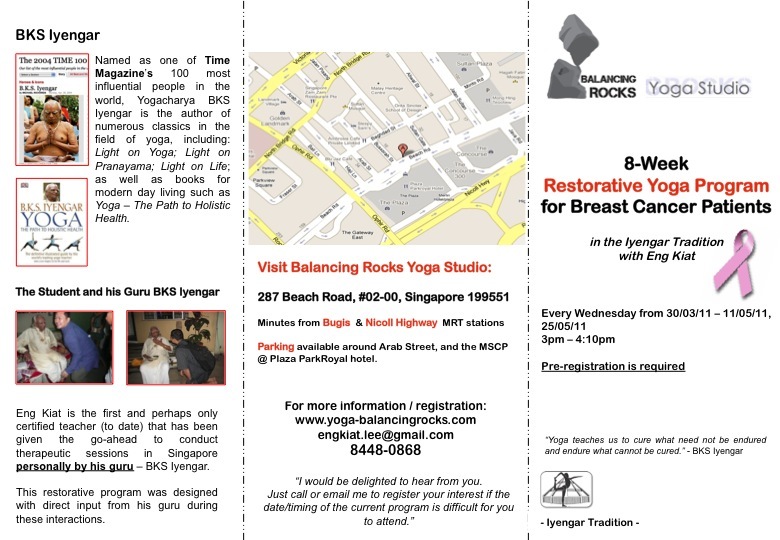 I have been trying to share the therapeutic aspect of Iyengar Yoga with people in Singapore for the past 2 years. Some are beginning to comprehend, and other still wonder how an 'exercise' can solve so many issues of the human body. Today, a piece of wonderful work that has started in 2009 or even before is finally released. Hence, I would like to share this wonderful short documentary that showcases the therapeutic work done in the medical classes at the Ramamani Iyengar Memorial Yoga Institute, in Pune, India. It was produced by Eddy Marks and Mary Obendorfer. Nonagenarian yogacharya BKS Iyengar or Guruji, as he is generally called, conducted a three-day yoga convention in Guangzhou in June 2011. The convention was part of a cultural exercise commemorating 60 years of friendship and diplomatic exchange between the governments of India and China.